1. Save Floor & Drawer Space by Hanging Things Up! Instead of having a pantry, our home has a laundry room right off the kitchen. It didn't take long for us to realize we needed a good place for storing cleaning supplies and other non-food items that we still want close to the kitchen. 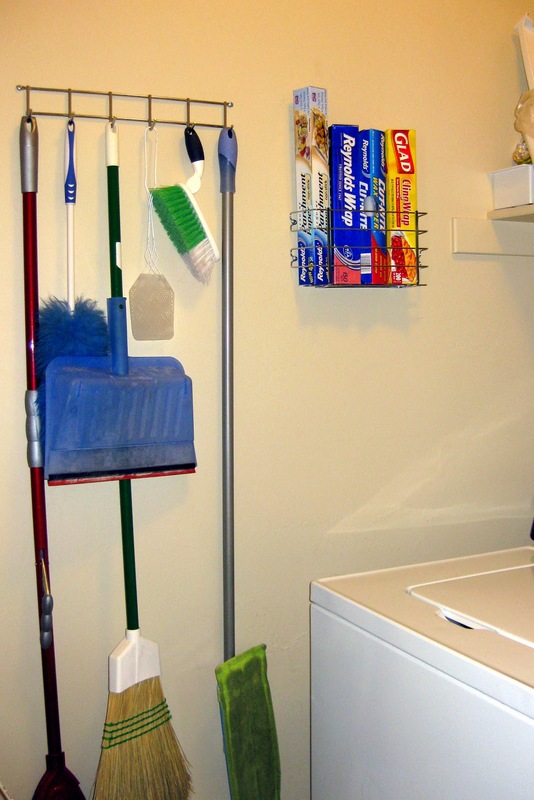 We bought wall hooks to hang our brooms and mops on the laundry room wall so they don't clutter up the floor. We also bought a wall-mount basket to store our aluminum foil, plastic wrap, etc. so that it wasn't occupying any of our kitchen drawers. It's close enough to the kitchen that it is still convenient. We have also saved a lot of space in the garage this way. Wall hooks hold our snow shovel, push broom, kids' t-ball set, folding chairs, and kids' bikes off the floor. One last thing that we got off the floor and hung on the wall is our bedside tables. Instead of a traditional table, we use floating shelves. Just be careful how much weight you place on floating shelves. All we kept on them were lamps, clocks, and the occasional book, so it worked for us. 2. Lose the Closet Doors! Our kids' rooms are quite small. 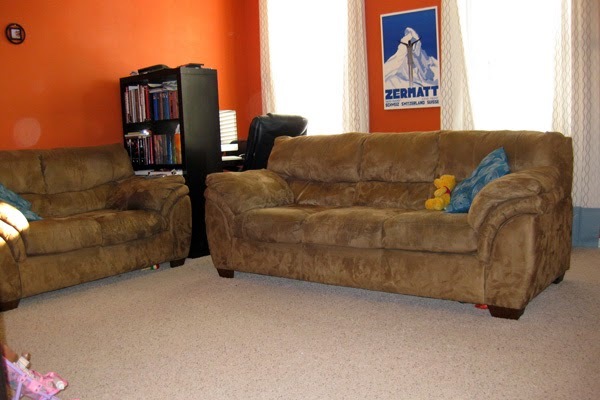 In a small room, you run into a problem of not having enough wall space for the furniture. In order to give ourselves more space along the walls, we simply removed the closet doors from the kids' closets. We store things that don't have any other home up in the top of the closet. Short dresses and shirts hang from the rod, then a shelf with drawers sits below. The right-hand corner of the closet (not pictured) is filled with extra blankets and the kids' laundry basket. Losing the closet door freed up the left-hand wall for my daughter's dresser. 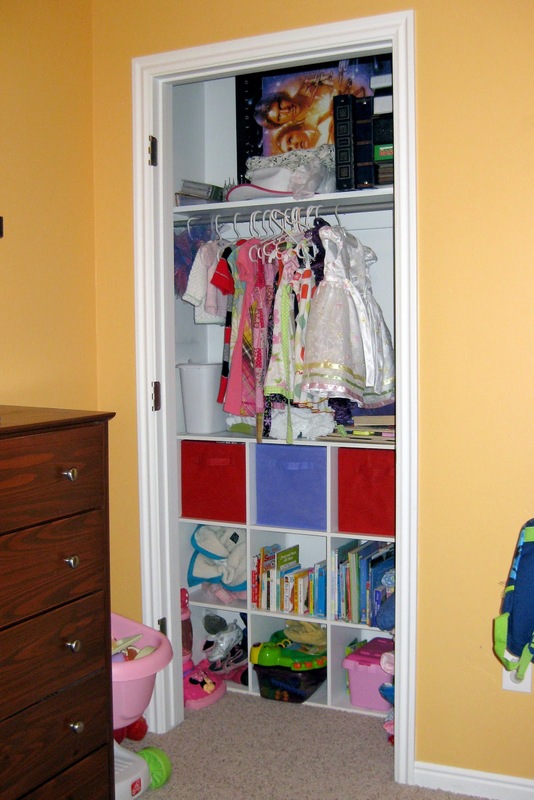 My son's closet is the same way -- boxes of baby clothes fill the top shelf, clothes can hang, then a similar shelf uses the closet floor space to hold clothes, books, shoes, and dress-ups. Losing the closet door freed up space in his room for his bed. 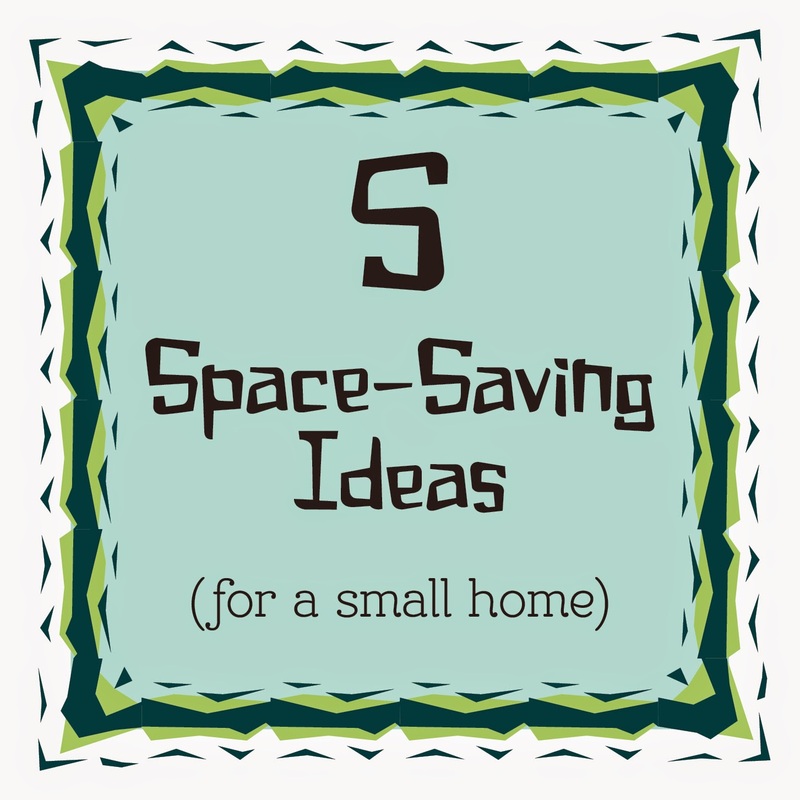 This one might not sound "space-saving" right off, but it has helped us save space. Instead of getting lamps, which generally need to sit on something (be it the floor or a table), we installed dimmer switches in both of our kids' rooms. I maintain that this was the best idea I ever had. It helped during night-time feedings when they were babies and it helps today when someone is afraid of the dark. The fact that you don't have to worry about cords, plugs, or batteries is just an added bonus! Obviously, this won't work for all furniture, but simply lifting beds a few inches can provide storage space underneath for seasonal clothing & decor, extra bedding, or anything else that can lay flat. 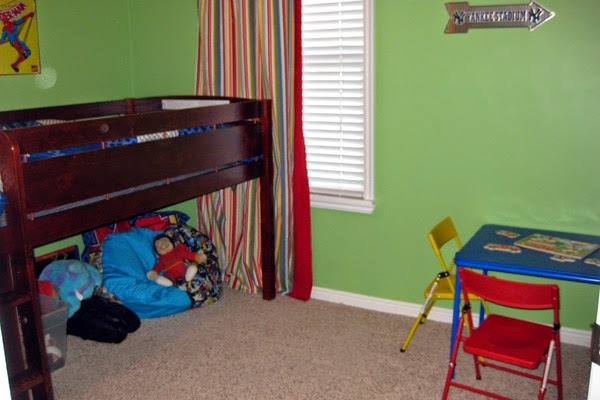 We took a more extreme approach when my son graduated to a big-boy bed. We got him a low-loft bed. This leaves usable floor space beneath it. His dresser fits under one end (we purchased it with the bed so that it would be the right size) and he stores most of his toys under the bed. The loft is high enough for kids to sit underneath it, but it's low enough that it's still fairly easy to make the bed. Plus, it makes a great fort when the kids so inclined. Most of the furniture that we have purchased in the last seven years has served more than a single purpose. 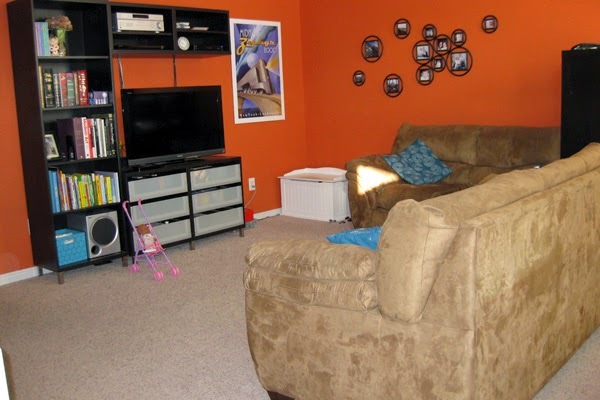 Our entertainment center includes drawers to store movies, video game consoles, and small toys. Our desk is an Ikea Expedit Desk that attaches to a bookcase on one side. This was a life-saver when our second child was born and we needed to move our computer out of our third bedroom. The shelf holds office stuff on the bottom two shelves (file boxes, printer paper, cords, etc). The upper shelves hold books on one side and more office stuff on the other side. It serves as an excellent room divider so it doesn't feel like the computer is in the middle of the living room. The last combo piece we added was a combination shelf/pot rack to go over our kitchen sink. Pots hang from it and our canister set sits atop it, which saves a lot of cabinet and counter space. 6. Bonus Tip! Don't Be Sentimental. One of the most important things we have learned in our space-saving endeavors over the years is to stop being sentimental about our stuff. We do store some items we never use (like my wedding dress), and some things we hope we never need to use (like our 72-hour kits), but we have tried not to get sentimental about things that don't deserve it. If it's taking up space and not serving a necessary purpose, we don't hesitate to donate or sell it! Do you have more space-saving tips? I'd love to hear them, so please leave a comment! Great tips! As an apartment renter I'm always looking for ways to create more storage or make better use of my space. Thanks for sharing! It's amazing the things you come up with (or get rid of) when you live in a small space. Thanks for stopping by! Thanks Sara! I feel like our house could be an Ikea showroom sometimes, but we've yet to find better space saving furniture anywhere else. Yes, I love the loft bed because it leaves the floor open. That was definitely a good choice for us! Thanks for stopping by! We have a closet without a door, as well. It expands the room! It really does! We've thought about putting in the bi-fold doors instead, but so far haven't needed to. I imagine if you had older kids, you'd want some way to cover the closet.